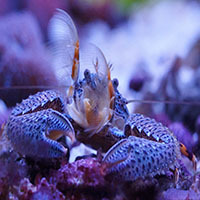 Notes: A peaceful and reef safe crab, this small crab enjoys a lot of live rock and companionship. It's a filter feeder but does enjoy small meaty food. Interesting to watch, as it has waving combs to catch particulates in the water. It can be found in the colors of orange, tan and a blue gray.